Wishing you all a Very Happy and Prosperous Ganesh Chaturthi. 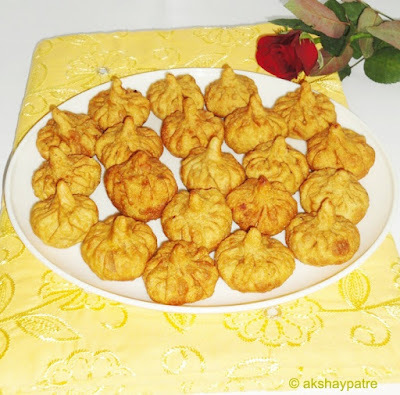 Fried modak recipe - Today is Ganesh Chaturthi. Ganesh Chaturthi is a festival which is celebrated with full swing all over India for ten days till Anant Chaturdashi. During these 10 days various dishes and snacks such as Ukadiche Modak, Fried Modak, Chakli, Kodbale, Besan Ladoo, Rava Ladoo and kheer made with moong dal, chana dal, etc. are offered to Lord Ganesh as naivedya and distributed as prasaad. Talalele Modak is a traditional Maharashtrian deep fried Modak prepared with wheat flour covering and coconut jaggery filling. Usually, for Naivedya 21 Modaks are offered to Lord Ganesh. Grate the fresh coconut in a large plate. Add jte jaggery to it and mix well. Then transfer this coconut jaggery mixture to a large pan. Place this pan over a medium flame and heat till the jaggery melts and mixes well with coconut. Heat the mixture stirring continuously till it releases nice aroma and becomes dry. The colour of the mixture should be golden brown. Now remove from the flame and add cardamom powder. Allow it to cool. In a large plate, add the wheat flour and salt. Knead it to a poori consistency dough using water. Divide the dough into 21 equal portions and shape them into round balls. Take one portion or ball of dough and roll them in the wheat flour. Roll out the ball to a small, round disc, using a rolling pin. Now place 1 tbsp of filling over the disc. Lift the edges to the top and join them. Shape it into modak and keep it aside. Repeat the same process to all modaks. Now heat oil in a pan. Gently drop few modaks in the oil. Deep fry the modaks on medium flame till they become golden brown. Strain the oil and place the modaks on an absorbent paper. Arrange the fried modaks on a plate. Offered as naivedya to Lord Ganesh. 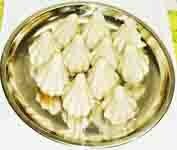 Distribute this naivedya as prasad. 1. Grate the fresh coconut in a large plate. Add jte jaggery to it and mix well. Then transfer this coconut jaggery mixture to a large pan. Place this pan over a medium flame and heat till the jaggery melts and mixes well with coconut. 2. Heat the mixture stirring continuously till it releases nice aroma and becomes dry. The colour of the mixture should be golden brown. Now remove from the flame and add cardamom powder. Allow it to cool. 3. In a large plate, add the wheat flour and salt. Knead it to a poori consistency dough using water.Divide the dough into 21 equal portions and shape them into round balls. 4. Take one portion or ball of dough and roll them in the wheat flour. Roll out the ball to a small, round disc, using a rolling pin. 5. Now place 1 tbsp of filling over the disc. Lift the edges to the top and join them. Shape it into modak and keep it aside. 6. Repeat the same process to all modaks. Now heat oil in a pan. Gently drop few modaks in the oil. 7. Deep fry the modaks on medium flame till they become golden brown. Strain the oil and place the modaks on an absorbent paper. 8. Arrange the fried modaks on a plate. Offered as naivedya to Lord Ganesh. Distribute this naivedya as prasad. 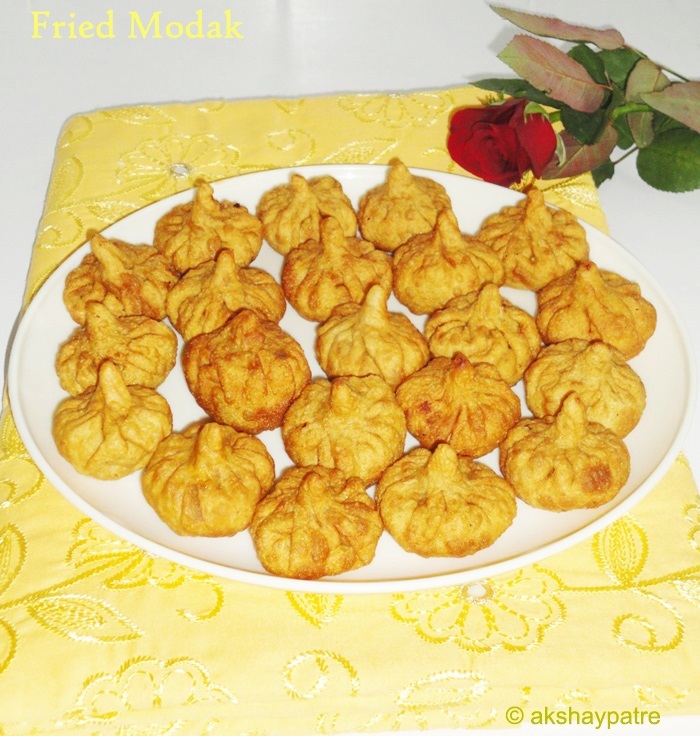 Never tried fried modak! Cute! very neat n clean step wise cliks..n modaks r tempting..